Despite their relatively lowly position in Philips’ 2018 range, the 6703 Series appears to offer substantial value for the price thanks to its basic Ambilight technology, direct-lit VA LCD panel and untested Saphi TV smart operating system. If you’re looking for the intersection of value and performance, the 6 Series - led by the Philips 6703 - is going to be Philips Europe’s entry-level 4K TV range for 2018. As usual with Philips, there will actually be a number of different ranges within the 6000 series bracket (in this case the 6503 and 6703), mostly differentiated from each other by design. We’ll cover the 6503 at some point down the road, but the range we’ve picked out here is the 6703, as these look set to offer the most attractive combination of features, design and price. Available in 43, 50, 55 and 65-inch sizes, the 6703 series present an attractive face to the world despite their relatively lowly position in Philips' 2018 TV range. Their pictures are contained within a reasonably trim metallic silver frame that perches on a pair of narrow, no-nonsense feet set a few inches inside the screen’s outer edges. Even better, the 6703 models feature a three-sided version of Philips’ Ambilight technology, which casts pools of coloured light - potentially able to track the colour content of the images you’re watching - from the screen’s left, right and top edges. This sounds gimmicky, but it really isn’t. In fact, Ambilight can deliver a more immersive and relaxing viewing experience, as well as add a ‘cool’ factor to your home entertainment center. There are a couple of issues with the 6703’s design, though. First off, it’s quite deep, but depending on your setup this may or may not matter since even the fattest 'flatscreen' LCD TVs will struggle to overhang a modern TV cabinet. If you want to wall mount it, though, it will stick quite a way off your wall compared with most of today’s TVs. The other problem is that using feet mounted towards the TV’s bottom corners could represent a problem if you’re looking to put the set onto a narrow bit of furniture. Most 6703 models will feature direct LED lighting systems (acting as a backlight to the image, not to be confused with the Ambilight LEDs on the rear), where the light sources sit directly behind the screen. This is good news, especially where the largest screen sizes are concerned, as it should reduce backlight clouding issues during dark scenes. Even better news is the use in the majority of the 6703 sets of so-called VA LCD panels rather than the IPS ones used on Philips’ equivalent TVs from 2017. VA panels generally deliver much better contrast than IPS ones - and this seemed to be born out during a demonstration of the 65-inch 6703 model showing a contrast-rich movie scene with black bars above and below the picture. Speaking of contrast, the dark areas looked suitably dark, even though the bright areas still seemed punchy and dynamic. Philips suggested that one screen size in the range may use IPS panels, but it couldn’t provide more specific details on which one it might be. The fact that most of the screens are using VA technology, though, has instantly made them much more interesting. The 6703 series boasts some other promising features, too. Its motion processing claims a virtual fame rate of of 1100 ‘PPI’ (to use Philips own terminology), for instance, that should remove judder and blur during action scenes. It can play HDR in both the HDR10 and broadcast-friendly HLG formats, as well as converting standard dynamic range pictures to HDR using Philips’ impressive processing system. Now for the bad news. Starting with the fact that its pictures are created using Philips’ Pixel Precise Ultra HD processing engine rather than Philips’ more recent, much more powerful P5 system. This will almost certainly mean they suffer more noise and reductions in contrast, sharpness and colour compared with Philips’ more expensive 2018 TVs (the P5 engine starts with the 7 series upwards, including ranges such as the Philips 7303). Having said that, though, even the Pixel Precise Ultra HD system is pretty potent for what will likely be very affordable TVs. 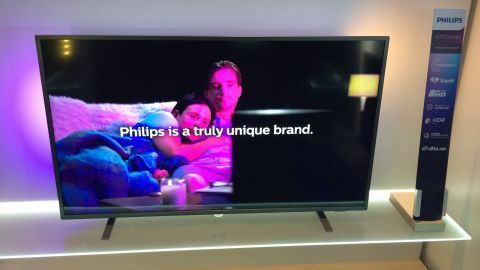 We don’t yet have full pricing information, but Philips let slip that the 65-inch model may only cost around 1,500 Euros. It’s important to note, too, that while the 6703 series uses direct lighting, it doesn’t back this up with local dimming, where different sectors of the LEDs could output different light levels, to boost contrast. This partly explains why the screen only claims to output a maximum brightness of around 350 nits. This suggest that you’ll only get a limited impact from the screen’s HDR capabilities - though at the same time, it’s possible that the relatively low brightness will help it deliver better black levels than over-ambitious rivals. The 6703 series doesn’t benefit from the Android TV smart platform that kicks in from the new Philips 7000 series upwards. That said, given Android’s rather clunky, hard to customise interface, though, this might not be such a loss. This feels like even less of a loss considering that Philips has replaced Android TV with a new Linux-based ‘Saphi' system that delivers a simple, sleeker icon-based menu system that, on first impression, suggests it will be much easier to use than Android TV. We'll need to test it at home for ourselves, however, as show floors and demo rooms typically aren't the best place to see real-world uses of a smart TV's operating system. As a budget TV, the Philips 6703 certainly has its merits - but, unfortunately, we’ll have to wait until we see it in our homes before we vouch for it. Philips estimates that its 6703 TV range will go on sale around May. And, from what we’ve seen so far, it’s definitely one to keep your eye on.